On the half way between Koblenz and Giessen, in the Lahn valley, which is the natural border between Taunus and Westerwald, you find the village Runkel with its imposing castle. A typical example of a premedieval defense building. Good Friday until end of October. Notification for guided tours required. 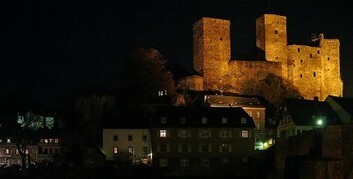 Runkel Castle has been built to safeguard the Lahn crossing and has been extended several times. 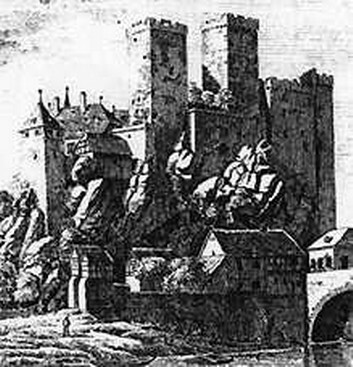 It was first documentary mentioned in 1159 with Siegfried von Runkel, who stands surety and witness for the countess Beatrix von Lauenburg at her entailing with the castle Nassau through archbishop Hillin of Trier. In his function as a trustee of the Reich, he might be responsible for the construction of Runkel. Probably Runkel was founded by the emperor Friedrich Barbarossa. In the year 1634 the palace had been destroyed by croatian troops of count Isolani and wasn't rebuilt again. In the year 1288 the families Runkel and Westerburg finally and definitvely divided. 1315 Dietrich von Runkel is mentioned. Dietrich, the third of its name, takes 1376 posession of the Zehnten (tithes?) Schupbach and Aumenau and gives order to build the palace beside the castle. the Lahn-Bridge is being build, but couldn't completed until 1448, because of a quarrel with count Reinhard von Westerburg. Melanchthon, Luther's friend and helper, is guest of Johann IV von Wied (a nephew of the archbishop Hermann of Cologne) at Runkel palace. 1568 the reformation was introduced to Runkel. Sovereign count Hermann II was expulsed of palace and reign at 9th of September in a brawl by his younger brother Philipp Ludwig, who ment to been set back at the inheritance. Runkel's most disasterous day in the Thirty Year's War was the 15th of October. 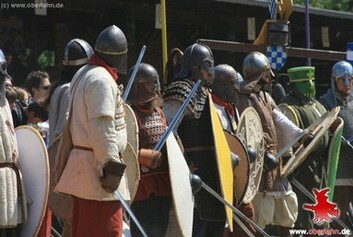 The croatians of count Isolani climbed over the wncient palace. Count Friedrich Ludwig is raised into a heriditary princely rank by emperor Leopold II. Troops of Darmstadt threw out the French in a nightly street-fight. the right-sided part of the government Runkel and also the belonging part of the village was attached to the new, by Napoleon created, grand duchy Berg. Friedrich Ludwig, the last decendant of the house Wied-Runkel died. 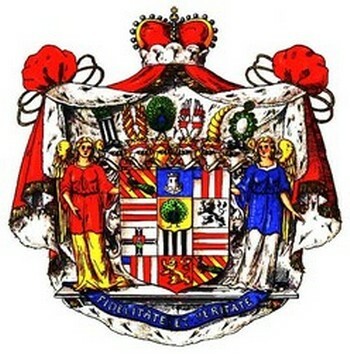 Wied-Runkel was inheritated by Wied-Neuwied. 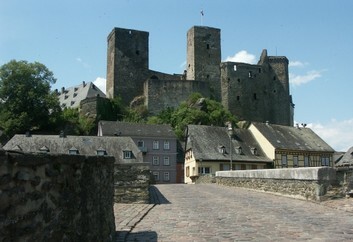 Runkel Castle is still the property of the house zu Wied.